Japan's ruling Liberal Democratic Party has chosen moderate lawmaker Yasuo Fukuda as its new leader and likely successor to Shinzo Abe as PM. 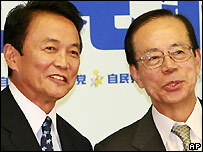 Mr Fukuda, 71, who wants closer ties with Asian neighbours, defeated hawkish former Foreign Minister Taro Aso. Mr Abe quit unexpectedly two weeks ago in a move that drew wide criticism. His resignation followed an embarrassing defeat in Japan's upper house elections in July, and a series of political scandals. 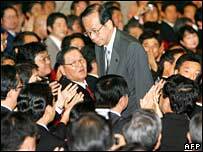 Mr Fukuda won 330 of the 527 valid votes cast (63% of the ballot) against 197 for Mr Aso. When parliament meets to elect a new prime minister on Tuesday, Mr Fukuda is virtually guaranteed to clinch the job because the party controls the more powerful lower house. The bespectacled vote winner bowed solemnly to the applause of party lawmakers after the result. "The LDP is facing an extremely difficult situation and I want to work first to revive the party and win back people's trust," he said. Aso: Conservative and foreign policy hawk who called China "threat to region"
Mr Fukuda has promised to stay away from Tokyo's controversial Yasukuni war shrine, seen by many in Asia as a symbol of Japan's past militarism. He wants to pursue a more conciliatory approach with Japan's neighbours China and North Korea. He has also said Japan's relationship with the US will continue to be the "cornerstone" of his foreign policy. And despite growing opposition at home, he plans to continue Japan's logistical support in the war in Afghanistan. A member of the political elite, Mr Fukuda is the son of a prime minister from the 1970s and was former chief cabinet secretary under Mr Abe's predecessor, Junichiro Koizumi. The BBC's Chris Hogg in Tokyo says the LDP's new president was seen as the safer pair of hands between the two candidates. After Shinzo Abe's messy resignation and gaffe-prone administration, party members are looking for someone who can steady the ship, our correspondent says. Mr Fukuda has pledged to trim the mammoth public debt of the world's second biggest economy. He has also promised to tackle the growing income gap between poorer rural areas and wealthier urban zones. His rival, Mr Aso, 67, had advocated a tough line towards North Korea and rejected changing the law to allow women to ascend the throne. He also described China's growing military spend as a threat to Japan and the region. Mr Abe, 53, remains in hospital after being admitted with a stress-related stomach complaint a day after his resignation.